SAN FRANCISCO — With Gartner predicting some 20 billion IoT devices that will be connected by 2020, healthcare organizations are in for significant operational challenges, and it’s not just the IT department anymore. That’s not typically the case today, added Liz Centoni, SVP and GM of Cisco IoT. While that answer will depend on the organization and particular IoT devices, it highlights a disconnect that Watchinski and Centoni said smart organizations will work to address moving forward because, among other reasons, of the ever expanding and increasingly more sophisticated cybersecurity threat landscape. Consider, for instance, the case of popular fitness trackers and so many other personal devices that employees are using on their own. Miranda explained that any notion of a security shop coming in and dictating how the business should be run is a mistake and, instead, the teams should partner and connect. From there, Miranda recommended homing in on visibility of IoT inventory. 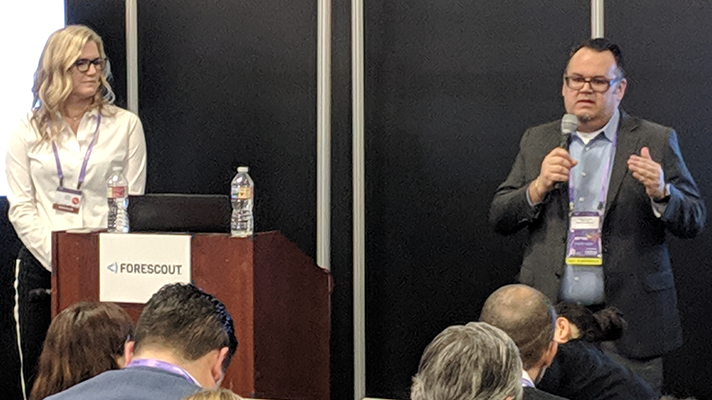 “IT, OT, and IoT, if you look at best practices — SANS, NIST frameworks — step 1 is always hardware asset management,” added Ellen Sundra, VP of sales engineering, Forescout. Sundra and Miranda agreed that visibility is everything with IoT. “I’m not a ghost hunter. I can’t protect what I can’t see. I need a dashboard to give me my bearings,” Miranda added. With the wild proliferation of IoT devices, some of which manually connect to your network, it will be more imperative than ever for IT and OT to align in support of the broader mission.